A man holds a tether to keep a cow's back legs from kicking whilst a woman milks it. Men were forbidden from milking unless no women or children were available, such as on a journey. To the left two other youths are standing nearby, one wearing thiau armrings on his right arm. 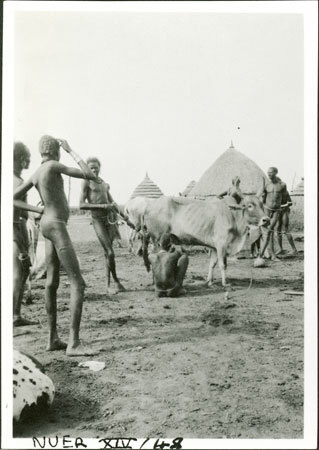 This image was taken at Yakwach village on the Sobat, which Evans-Pritchard revisited in 1935. Note on print reverse ms pencil - "64 A182" & print front border ms ink - "NUER XIV/48"
Morton, Chris. "Nuer milking" Southern Sudan Project (in development). 03 Jan. 2006. Pitt Rivers Museum. <http://southernsudan.prm.ox.ac.uk/details/1998.355.674.2/>.